Et quand ce n’est pas Van Gogh qui nous inspire le Brandal, c’est William Friedkin. Peut-on parler d’ambient pour la sorte de B.O.de film de frousse qu’est Turning Point ? Une loop et un clavier minimaliste suffisent à m’hypnotiser et les bribes de mélodies pop nous cachent ce qui nous attend : la frousse, donc, d’une ambient toute kampushienne (autrement dit : élevée en cave). 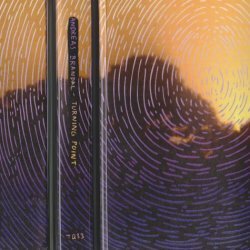 Tranquility Tapes presents Turning Point, a full-length cassette by Norwegian sound artist/noise maker Andreas Brandal. The packaging is very nice for this cassette release. A full-color j-card is provided, depicting what appears to be the sun rising above some dark clouds. A pattern of circular lines resonate from the sun. The cassette itself has gold inlays with the same lines from the cover printed on the shell. Very pro! I have to admit this release took me by surprise. I’m not too familiar with Andreas Brandal, but judging by the cassette art I was expecting Turning Point to be a really chill ambient album. However, I couldn’t have been more wrong. To my surprise, Turning Point delivers 8 tracks of eerie and mysterious soundscapes akin to the soundtrack works of Tangerine Dream and Goblin. Sonically, Brandal’s pieces are synth oriented, however traditional instrumentation is also incorporated, most notably the classical guitar found on track 2, “The Impossible World.” “Silent Screen” could almost pass as an alternate soundtrack to Castlevania, eerily playing in the background as Simon Belmont navigates toward the steps to Dracula’s castle. On “The Voice From Nowhere,” Brandal weaves some metal clanging and rustling to his chillingly progressing soundtrack. On “Dead Planet,” Brandal even manages to incorporate a Jew’s harp into the mix. From beginning to end Turning Point is the perfect accompaniment to things that go bump in the night or possibly your next RPG session. I can’t help but be sucked into the dark tapestry Brandal weaves. A truly exceptional album through and through. I’m trying to remember the last time I got a Halloween present, especially one in the mail. Probably was about the last time I did a holiday-themed post on ye ol’ Tome… which was never. And I guess this music isn’t meant to be as absolutely perfect for today (October 31st, that is) as Andreas Brandal actually made it, but Hell (note the capital H here), if this isn’t Transylvania-rock at its finest, I’m not sure what is. Plus, the cover is orange. Or, the cover has orange in it. So yeah. Anyway, Turning Point shows up in my box, I pop it in and all of a sudden I’m surrounded by encircling synths bearing down with a spooky intensity that instantly reminds me of Goblin’s score to Suspiria. Norway’s insanely prolific synth-mongerer already has at least one tape out that I know of in 2012, a black-hole of zoned-out drones out on Field Hymns. This new release via NY’s Tranquility Tapes matches that one at the very least in sheer darkness while adding a nice melodic center. Brandal’s arms are the pipes of an organ here, all gothic, foreboding and intimidatingly minor in key. And Moduli TV’s visuals appropriately keep the creep-factor up to par as well, what with the darkened frame, swooping birds, ominous window and faces cast in shadows. The entire thing smacks of classic horror, making this one-and-only holiday themed Videodrone a complete success, wouldn’t you agree? Nab a copy of this excellent tape from Tranquility Tapes today. And of course… Happy Halloween! Be safe out there, kids.